'Look! Up in the sky!' 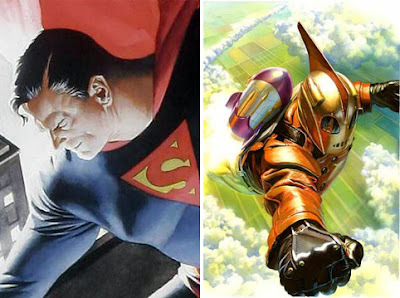 Doesn't only apply to Superman, and in a stroke of pure genius, the late Dave Stevens once pitched and scripted a three issue team-up between a still flightless Superman and his own high-flying hero, the Rocketeer. Revealed today on CBR's POP!, Stevens' Rocketeer / Superman: 1938 miniseries is still out there - practically all ready to soar. Stevens' own plot and scripts for the first two issues are complete, as is the plot for the final issue itself. Basically, the rundown is this; Meeting during the hysteria caused by Orson Welles' infamous War of the Worlds radio broadcast, the two heroes team-up to stop the Bix Bentley gang, before they can implement the notorious plans they have in mind for a kidnapped prototype robot. Good, classic stuff. Originally nixed over revisions DC wanted to the plot (the publisher at the time not so hooked on the idea of using 1930's Superman), now present for a switched on DC and/or IDW, the closest thing to a 'just add water' hit in modern comics. Script snippets are also up at Pop!, so be sure to scoop them up when you get a chance. My favourite line, after Clark Kent defends his costume with the fact his mother made it, Cliff Secord counters with; "Okay. But that doesn't mean you outta be wearin' it out in public! C'mon, Cal -- you're a grown man, and look at yourself!" you know your doing something right as an artist when you can make a goofy looking character like the rocketeer look cool. great perspective and fore shortening in that flight piece. Dave Stevens is another artist that really knows how to draw women well. his style kinda reminds me of Adam Hueys cover art. I love that Rocketeer piece. Both look like they were taken right out of the old Masterpiece trading card sets of the early '90's. David I think there's a strong Stevens influence in Adam's work too. Especially in some of his Wonder Woman work. Craig - I loved the Marvel Masterpieces series' - especially Joe Jusko's. There are some character shots Joe did in that run that I think have yet to be beaten as iconic images of that character.